These are very nice pillows. Not too firm and not too soft. We’ve had them for over a year now and they are still holding up really well. Would purchase again. Rest easy in unparalleled luxury with the Nikki Chu White Goose Down Pillow. 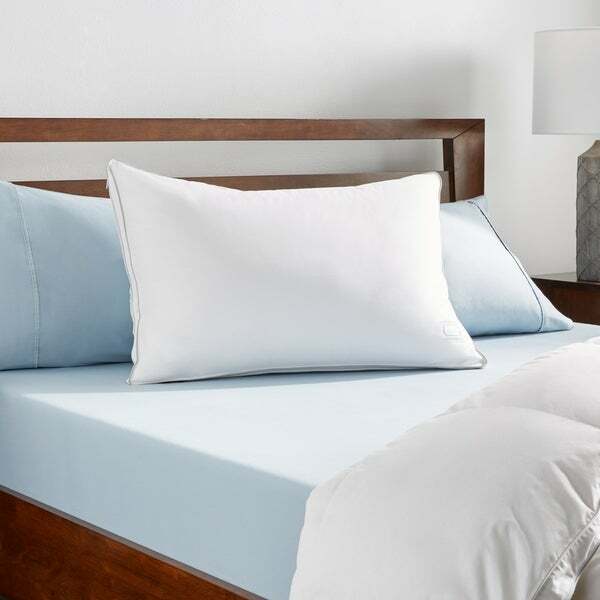 This pillow features a soft, 100-percent cotton construction with a removable 300 thread count sateen cotton cover and is filled with the highest quality hypo-allergenic white goose down. We've had the pillows for a while now. Do I love them now as much as I did when we unboxed them? No... I love them even more! My husband is the feather pillow type. I had much preferred a solid foam pillow. I was never happy with his choice of feather pillows and how they just always seemed to go flat and worse, how I would get poked by feather nibs even with a protector cover in place. My only regret with purchasing the four is that we didn't order more of them. I've retired my favorite foam pillow to being an insert for a decorative cover for the bed and now we only use these to sleep on. We both use two. It works out really well. They hold their shape while still being so easily conformed to how we want them to form. I didn't notice any foul odor when we first unpacked them. There was a whiff of fowl, but that's due to what they are made from and the fact they were sealed for shipping etc. That quickly went away. Before using, I pulled the covers off to wash them and put 2 pillows at a time into our dryer with a sanitize setting. They came out looking twice the size they were before I stuffed them into the dryer. I felt it was important to do this before sleeping on them. It was a bit of fun trying to stuff them back into the covers. My advice? Scrunch two end corners of the pillow together, hold them tightly in one hand, center the cover over your hand then pull the cover up over the pillow while your hand still holds the ends to the bottom of the cover. This way, it won't take what seems like forever, to get the covers back onto the pillow. When you release the corners as you have the cover more than half way up the pillow, they will plump into place. Twice a month I wash the outer covers and sanitize the pillows. They continue to be the most amazing pillows ever. I thought I would miss my former pillows, but not after having slept using these. Goes to say, there are feather pillows and then there are these pockets of marshmellowy cloud puffs that make you forget why you ever hated feather pillows. I wanted a down pillow to mash into the right shape. A side sleeper, I chose this medium firm pillow to support my noggin as my shoulder is wedged into the mattress. I miss the lofty fluff of a lightly filled down pillow, but disliked the eventual collapse of the lovely softness into a flat mat. This Nikki Chu pillow is less lofty and more foamy feathery feeling. It keeps its density. No crunchiness, no off odor. The pillow protector is a bonus. In place of my old lofty-but-deflating pillow, I am falling asleep (important!) on this denser mashy down pillow. Washable goose down. Very soft. Comes in a dust bag like high-end purses do. No smell. Love them. These pillows are certainly very puffy and filled with a lot of goose down and feathers. They do smell a bit like goose (but at least you know they are what they say they are). I personally returned these pillows because I actually experienced them as overstuffed and they hurt my neck. If you want a very firm pillow, this might be a good choice for you. For the price of this pillow you might think you are getting the very best of the best in down pillows, but from my recent trial and error process, the very best down pillow will have a little more "give" because it won't have any feathers in it, just down. This pillow is 80% down. I wanted the ideal pillow, so I ultimately spent a bit more and got something that felt very full and lofty yet gentle and not stiff at 90% down (I don't think anyone legally claims more than that). I like down pillows and this pillow has suited my needs. It is very comfortable and true to size (king). I would recommend this pillow to anyone who is looking for a new down pillow! Love this pillow!! It’s soft but firm. Looking into buying more for the other bedrooms. You will fall in love with this pillow. Night are so much better. Love this pillow!!! You get what you pay for with this pillow! You may find one for less money, but it will be less quality and less down filling. I now only need one pillow to sleep on at night. I just ordered my second pillow of this, and will probably order a third. Took me a few tries, with other pillows from O but this one has in my opinion, medium firmness. Not so firm your neck gets sore and the other I ordered was fluffy but when you put your head on it your head sank right the mattress and the sides of pillow came up around your face. I love down pillows and the one I had been using was worn out after years and years. I took a chance on this one, and I love it. It has just the right loft and no odor at all, which I have read is a problem with some down pillows. WONDERFUL PILLOW! Definitely Worth Spending the extra $$! Just the perfect firmness! Love these pillows. A bit pricy but worth it. Very much enjoying this pillow at the moment haven't had it for a super long time and I'm hoping that the firmness that I am enjoying right now lasts for at least a little longer than pillows purchased in the past! "Someone please answer the fill-power of these windows? Pretty please?" This uses a 650 fill power. "What is the fill power of these pillows?"